In a lot of ways it is about time for some major Diana focused episodes. Even the reveal about her having that super rare Chariot card wasn’t very noteworthy. That has been an extremely safe bet since about episode 2. Still it will be nice when Akko finds out and they can potentially share a bond of being fans of Chariot. It will still always be a bit of a painful thing for Diana since the Shiny Rod chose Akko. Heck, Chariot herself is acting as Akko’s personal tutor and when that finds out it will be an additional burn. But, it would be nice if they could stand on the same level and build a sense of friendship. I’m just glad we’re getting two episodes at least to focus on this story. 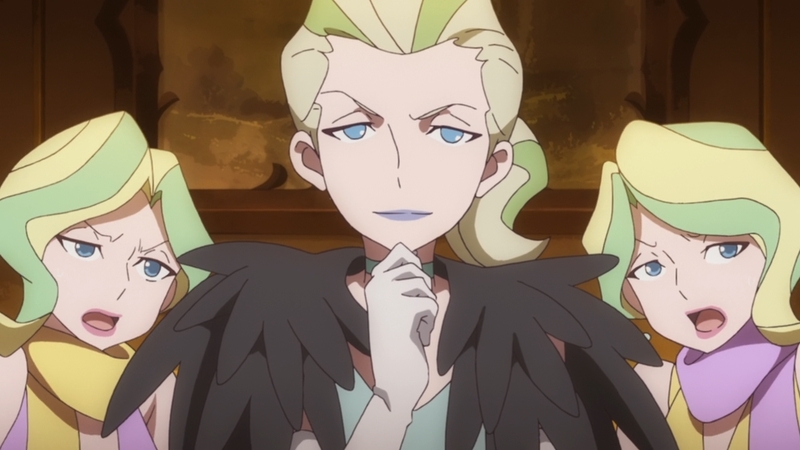 Maybe with Amanda or Constanze you can do a one-shot, but not here with Diana. We’re finally at the point that they’ve been hinting at for a bit. Diana’s family is in a critical disaster. I’m sorry, but her Aunt is utterly insane. Daryl is basically running that family into the ground. I don’t think it’s a crime for her not to be a traditionalist, but she’s just dumb. Pride and traditions don’t put food on the table? That may be the case, but neither does running a family into destitution. Making money puts food on the table. A sustainable source of income puts food on the table. Selling off valuables is one of the last steps before bankruptcy. There is no sustainability in selling off everything you can find in your house instead of getting a job. But Daryl just doesn’t have a clue. She’s desperately trying to sell off everything she can find without realizing there is no future in that. I honestly don’t know if Diana’s mother was good or bad with money herself. And certainly it seems like we’re building up to an “old and new working together” idea. But I will say that things clearly can’t stay like this. Daryl is basically bleeding the family dry until there is nothing left. Also she seems to have no sense at all. 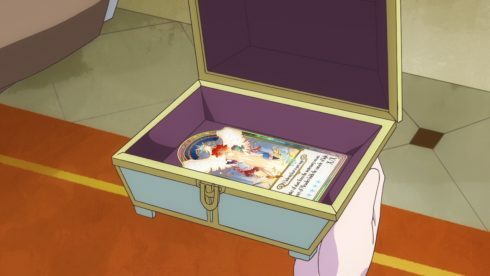 Her plan was to sell old goods and magical artifacts….to Andrew’s father? Someone who hates magic and witches to an extreme degree? What is she thinking? That’s just a bad idea in general, though that is a good thing since Diana has enough problems. Trying to stop Daryl from selling valuables would be another troublesome challenge to undertake. 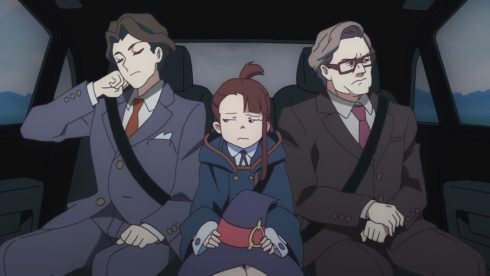 And now you’ve got Akko throwing herself into the mix. It is good for her that Andrew is basically just openly cooperating with her these days. No doubt it was Andrew that had the driver pull back to pick her up and it couldn’t have been easy to get his father to agree to that. 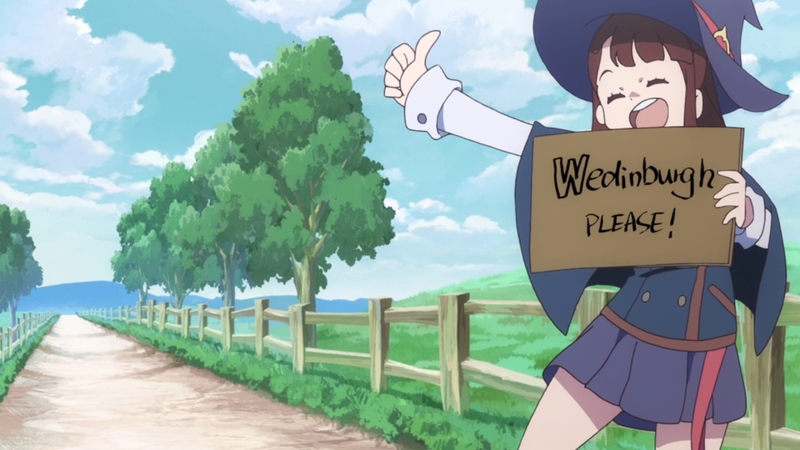 I can understand Akko not wanting to let this go. From her point of view Diana is an ideal to chase down. She’s seen Diana’s thoughts in her diary and realizes how big picture of a person she is. 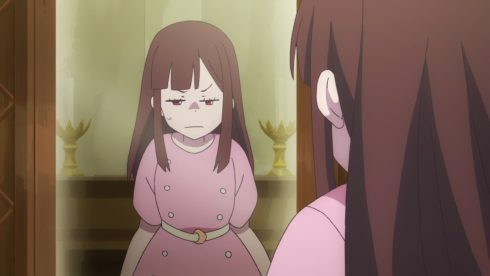 She has a lot of qualities Akko wishes she had and there’s no way she can just let her walk off. I think she both wants to compete with Diana head to head and also wants to see her chase after her down dreams. In a lot of ways it was plain fun watching Diana and her maid just rip into Akko at various points XD. 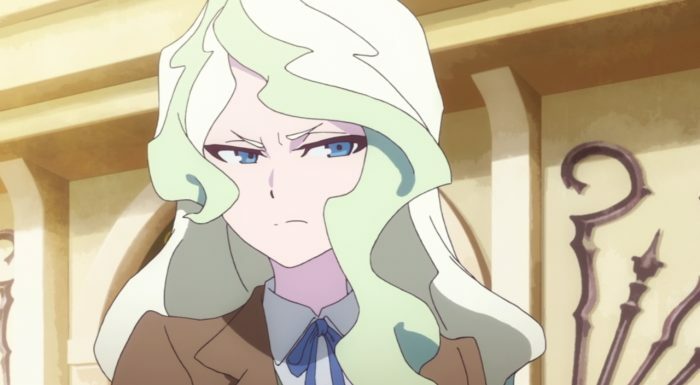 And yet it shows that Diana does have respect for Akko and wouldn’t let her Aunt insult her. 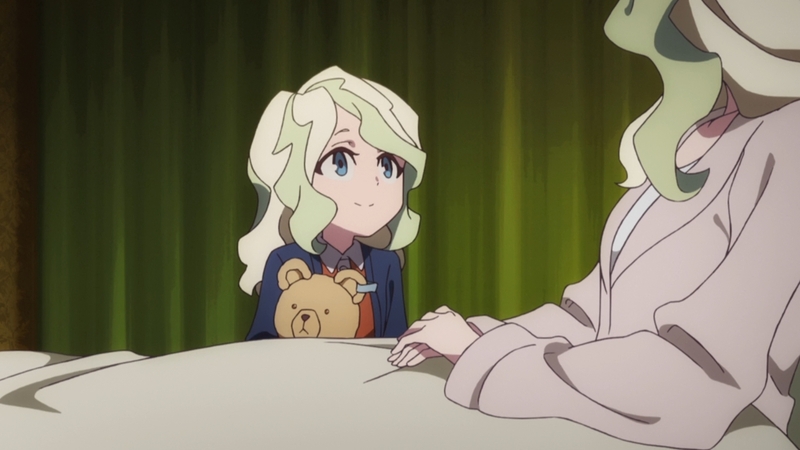 After all Diana knows that Akko is special or at least important enough that the Shiny Rod chose her. That means something to a closet fan like Diana who wants to make the world a better place. And it had to be hard for her to basically have to give up and leave all that to Akko. I’m curious to see how Akko will be able to change Diana’s mind. Though I suppose there are several options they can take to wrap this up. Maybe they simply smack Diana’s Aunt around and make her come to her senses. That woman is trying to channel the step-mother from Cinderella, complete with the announcing daughters she has. But there may be a way to make her see reason. Of course maybe Diana just takes over as head of the household and still goes back to school XD. But, I think they find a middle ground that allows Diana to wait until the next opportunity to take over the family and finish her education. There’s no way to tell, but I think that’s where this goes. This was a good episode. I think bringing the focus onto Diana has helped pick the show up a bit. Now let’s see Akko awaken another word and help out her sort of friend/rival at the same time.